Luned Rhys Parri's work is always filled with warmth and humour. While making us smile, and while creating that warm glow inside, she is deft and observant enough to catch the telling details which allow us into her characters' world: A world that is uniquely Welsh, and may be fast disappearing. Her benevolent whimsy is shot through with a keen awareness of the passing of time, and the fragility of the things which once lost or squandered, can never be retrieved. She reminds us to look after the small things, and to remember. 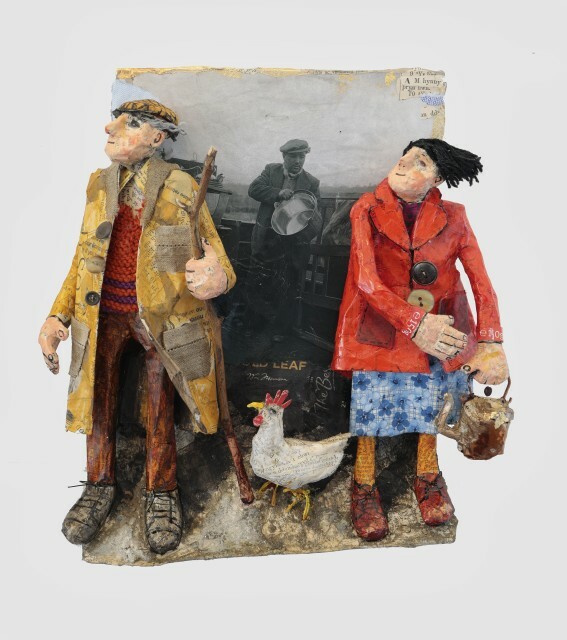 She evokes quintessential everyday occurrences in Wales in her wonderful, quirky, three-dimensional images. Often based on memory of the countryside and towns of Wales in her childhood, Luned loves handling simple materials such as tinfoil, cardboard, paper and wire - these are combined with a painterly surface to create a unique image of tender wit and humour. Luned has won numberous awards and has shown many times in Wales and on a national basis. She has also lead workshops with young people in many institutions, festivals and schools. Experiences which have regularly brought her into contact with new people and personalities which have inspired new works back in her studio. Luned Rhys Parri RCA presented her first solo exhibition at Ffin y Parc in the summer of 2011. She exhibited again in 2013, 2016 & 2018. Luned returns again in July 2019 during our celebratory 'Welsh Women' Exhibition.